Students began to investigate food waste within their own classrooms, specifically breakfast. After investigating students noticed that the real food that was being thrown away (based on their data collection each morning for two months) was milk. 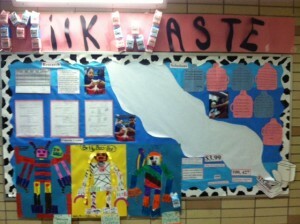 Students then learned about the benefits of milk for teens and created an ad campaign to promote students within their school to start drinking milk instead of wasting it.